Recently, Mr. X started giving me the same advice every day. I think it began one morning when I was begging him to go to brunch with me. Begging. (I knew he wouldn’t go, because he hates going out, but every now and then, I give it the good old college try.) After my hundredth plea, he just quietly said, “Let it go, girl,” which made me laugh in spite of myself. He’s said it so many times now, in regard to everything in life that I’m so desperate about, that, in addition to making me laugh every time, I think it’s actually beginning to work. I’m going to get to the yin-and-yang of it all in a second, but first, I must tell you that I’ve researched Cinderella, not just recently, but at other times, like when I can’t sleep, and I research any thing I can think of. So, I know there are many different tellings of this story, as with all fairy-tales. I’ve never minded that Disney did it one way, several ballet companies have interpreted it differently, and the film, The Slipper and The Rose, (with music by my old pal, Richard Sherman,) has yet another take on the classic tale. Those changes I’ve always accepted. After all, variety is the spice of life. 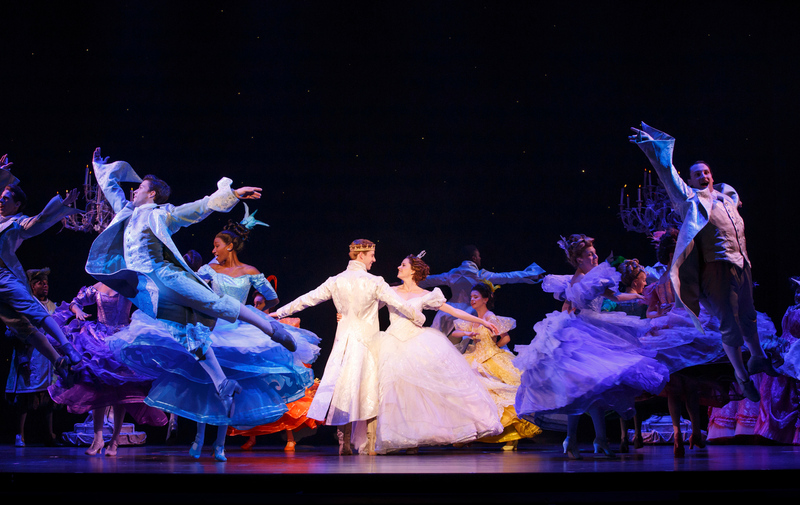 But when a show is billed as “Rodgers and Hammerstein’s Cinderella,” I fully anticipated seeing that exact show. I’m not saying this adaptation was bad, (although there were some less-than-stellar components;) it was just not what I was looking forward to. So I was a tad disappointed. But let’s get to the positives now, shall we? 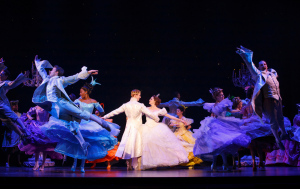 The show still features the fabulous musical numbers by Rodgers and Hammerstein. I could not stop singing that wonderful music from the moment I received the opening night invitation! (Mr. X wanted to know why I knew all the lyrics to every single song in the score. Silly boy. Has he met me?!) [Note: I was so grateful that it finally knocked-out the gorgeous music to the Dying Swan that I couldn’t get out of my head for the month since I had seen that ballet! 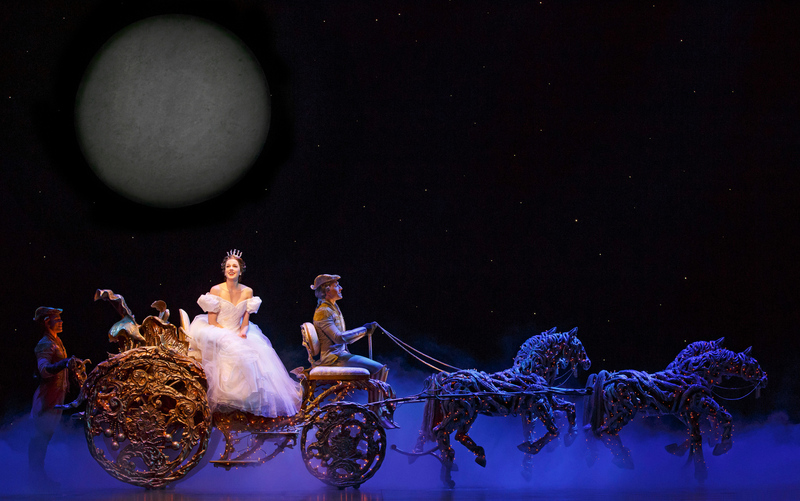 Don’t get me wrong–I love that music, but Cinderella has such a happier ending. (Duh!)] It turns-out, this Broadway show also features some little-known, or totally obscure, songs from the prolific duo, so people may be interested to hear those. In addition to the music, I loved the clever, colorful, utilitarian sets! And the quick costume changes were a joy to behold. Even the most jaded among us had to marvel at them! I love all musical dancing, even if this choreography was a bit simple. It was just really fun to watch. I hope you all get to experience the show while it’s in town. 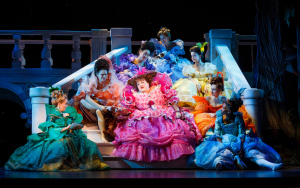 But what almost ruined the entire experience for me was the annoying Fran Drescher, as the Evil Stepmother. That dreadful voice can give one seizures!!! It’s way worse than nails on a chalkboard. She did manage to modulate her horrible nasality a tiny bit this time, but it was still pretty hard to decipher what she was saying. But one bad performance, no matter how glaring, doesn’t ruin an otherwise capable ensemble, in a colorful, fantastical show, as this one is, for me. There were no negatives as egregious as that one, but there were a few other little bothers, such as that no one in the cast was particularly fabulous, and I was a bit frustrated that the lead didn’t look like what I envision Cinderella to look like. So, to wrap-up the review, I say go see the show at the Ahmanson with an open mind. Just know it will be a newer, more modern, different take on the story. And enjoy it for what it is. And lastly, being the girly-girl that I am, I have to tell you about one little beauty bit that tied into the show, by coincidence, and made me giddy with happiness! A few weeks before the show, when I already knew that I’d be seeing it, a beautiful pink lipstick caught my eye when I was checking-out the site of my new favorite make-up company, Gerard Cosmetics. And guess what the name of the color was??? Fairy Godmother!!! I almost fainted! I love magical moments like that! If I were a little girl, you know that I would have dressed-up in fairy clothing for this show, complete with wand. As it was, I had to hold myself back from wearing my tiara! (And I’m not kidding! Even a little bit!) So, wearing this aptly-named lipstick to the theatre was my own secret little way to play dress-up. I love this line so much that I have a feeling I’ll be telling you more deets when I suggest it as a Mother’s Day gift, but it went so well with this review, I just had to include it here, as well. Maybe if Cinderella had had it, she wouldn’t have even needed a Fairy Godmother to help her get the Prince!